This is my first franken that I created back in February. I don't remember the formula but it was mostly black creme with some clear polish to give it the jelly base and a tiny thing of EDM pigment. The green pigment was a sample I received and I have no idea what it's called! This somewhat resembles HC Envy but I think my green shimmer is more bright. I am wearing 2 coats with Seche Vite. I call this one: Facet Emerald, You're Just Green! 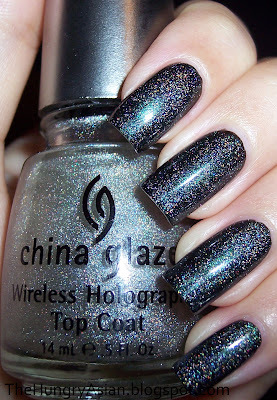 This is one coat of China Glaze Wireless Holographic Top Coat over Facet Emerald, You're Just Green! Ooooh! I can tell this TC and I are going to be good friends. Here it is with 2 coats. I love it! It dries fast and turned my franken into a blingtastic yum yums. Wow, I can only hope my first franken turns out so well (if I ever get around to doing any LOL). Gorgeous! That is a gorgeous franken! That is so pretty and I love the name you chose for it! I may have to get that Wireless Top Coat, lovely! That green is stunning! I love emerald shades and the name you chose is fantastic. Nice work! Very very nice Franken, the shade you made is gorgeous ! and with this TC, wahow !! Funny that I just bought an emerald green polish by RIMMEL just before I read your post! I've never tried geen nail polish before. Yours looked so beautiful! The Wireless top coat really gives it something extra, too. I've been wondering whether or not to try Wireless for a while now, I think this has pretty much convinced me that I should! That green is stunning! I even like it without the holo over it! ammmmaaaaazzzzing green kae!! i want it! wow - great franken! it looks amazing with the CG on it. You such a pro with nails! This is ama--zing! Goodness me, that green is a stunner!! Super creative what you've done with it - lovely stuff! Thanks! Lol franken tard, that cracks me up! Thank you! I like the top coat a lot. Thank you! Yeah I love that top coat I'll be making a mani last a little longer with that a lot! Thanks! lol you crack me up! Frankening is when you mix your own polish and custom make your shade. It's pretty fun to do but dang it is harder than it looks! Have you ever been to Dr. Frankenpolish's site? She has the most awesome frankens! Kae....that is a beautiful green you created. I love it. I can't seem to get enough greens lately...lol! And I love the layered holo look too. Thanks! lol me too I am liking them a lot. I love your play on words for the name of your polish! Very pretty shade you made. Looks gorgeous on those beautiful nails of yours.